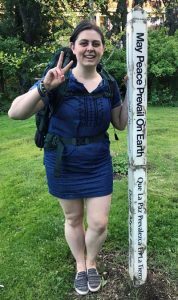 Laura Hay, Youth Peace Advocate, with a peace pole. Camp Pine Lake! This week has been full of joys and sorrows. It was a camp which invited conversation, and with a mostly silent group, that conversation grew in interesting ways. The conversation was there and prevalent but presented itself in creative ways. Camp Pine Lake has a program called “Human Body Image,” or HBI for short. It was something I have only encountered this week. This unique program divided females and males into two groups for the first session and talked about different ways that their gender was portrayed in the media and the effects it has on the people growing up in our society. The campers were able to talk in broad terms or about things being held more closely to their hearts. This is a challenging topic to take on in a week-long camp, but if nothing else, it made the campers more aware of the language being used around their gender and the ways in which they could have better self-talk. And that is a tremendous accomplishment. Because this was such a unique experience, I decided to bring in an exercise I hadn’t used yet. On the last day I had the opportunity to lead a silent recognition activity. Since we didn’t have the most talkative group, I thought they might feel more comfortable to be in silence and anonymously recognize the people who had affected them positively this week. Many of the campers were moved to know how much they had affected others, and others were moved by having the courage to recognize those who really affected them. Recognition and building a community based on the needs of the people within it is one of the first things to work towards as a peace building community. May the camp remain a place of safety: a place to be vulnerable and a place to expand our views about ourselves and the world around us.